Who doesn't love a weekend break in a quiet lodge, log cabin or cottage with a hot tub attached? 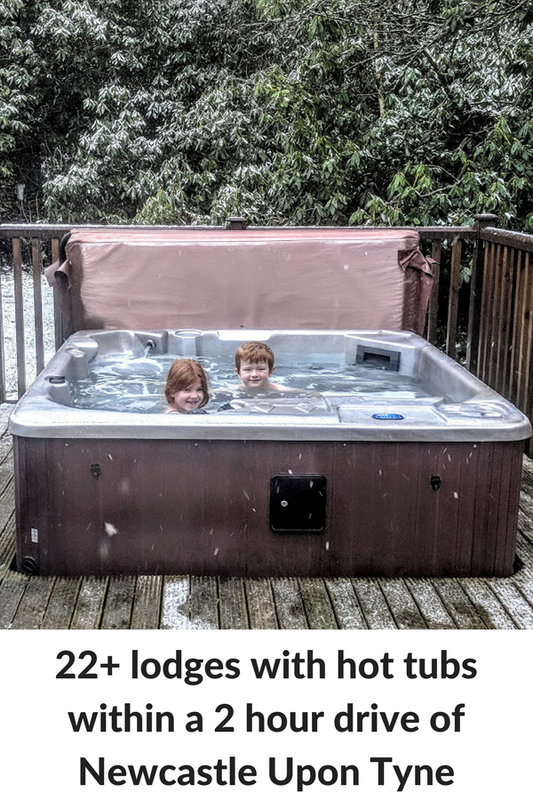 A hot tub is usually high on people's list of requirements when booking a short break and readers will often ask for ideas and recommendations so I decided to put together a list of 22 places you can stay that are within a 2 hour drive of Newcastle and all come with their very own hot tub. Let me know which one you fancy! South Causey Inn offer a selection of unique and quirky accommodation options and many come with their own hot tub. We stayed in their gorgeous Treehouse suite last year and their renovated double decker London bus is certainly popular. Private rooms are situated in the pub's grounds and you can pop in for a bite to eat or order room service. There are lovely gardens to potter around too with a duck pond, kitchen garden and a few animals to meet too. We've stayed at the Crab Manor near Thirsk a couple of times now and definitely recommend booking well in advance as they are super popular. All rooms can access a shared hot tub or there are a fair few that have their own private hot tub too. Rooms are themed and there is something for everyone. We like the lodges which are hidden in the hotel's grounds. If you love seafood, the award winning Crab & Lobster pub and restaurant is on your doorstep (and they serve a cracking breakfast) and complimentary pre-dinner canapes are served in the Crab Manor lounge for overnight guests to enjoy. You can find a hidden beer tap and help yourself to beer too! You can check out our review of the Crab & Lobster restaurant here. How about Brambles? A beautiful lodge in the village of Felton? Sleeps 4 and has a hot tub. Find out more here. Herding Hill Farm sits on Hadrian's Wall and offers private hot tubs attached to some of their WigWams or in their lodge accommodation. These are perfect for families who wish to really get away from it all. There's a play area, alpaca farm, small bar and pizza delivery available on site. We are so excited to be staying here later this year. The house sleeps up to eight guests and is a short stroll away from Embleton beach and village. There's a wood burning stove and hot tub and the cottage looks perfect for larger families. Griffin Forest is another favourite of ours. If you can picture what you imagine a woodland lodge to look like, the lodges at Griffin Forest will be it. The woods are home to badgers, deer, squirrels and foxes and many will come right up to your lodge. I love the little touches that are included in staying here such as wine and chocolates on arrival. Perfect! How about Little Gem Lodge in the Yorkshire Dales? A luxury lodge with a sunken outdoor hot tub in a tranquil location? Find out more here. Acorn Leisure at Felmoor Park near Morpeth is conveniently located just off the A1 and is a popular spot with locals looking for a short break. We stayed in a beautiful lodge with its own sunken hot and private hot tub earlier this year and were super impressed. These lodges are furnished to a high standard and dog-friendly too. Select a Premier Lodge at Kielder Waterside Lodges and you'll be treated to your own private hot tub to enjoy under some of the darkest skies in the world. There are lots of facilities to enjoy on site including a pub, heated indoor pool, cycle trails, gym, adventure playgrounds, mini golf and more. Some of the site's platinum lodges include even more luxury with underfloor heating, star gazing pods, fluffy robes and fancy coffee machines. This secluded cabin is perfect for those who want to get away from it all and are looking to live slow and in the wild. Spot deer, pheasants or even salmon swimming upstream and enjoy the hot tub, cosy armchairs and log burner in the evening. How about an Apres Ski Lodge with an open fire and hot tub? It's pet-friendly too. Find out more here. Village Farm near Alnwick is home to a luxury collection of holiday cottages - many feature their own hot tub. The on-site facilities are fantastic too with a swimming pool, spa, games room, horse riding, adventure playground and more. Woodland Lakes Lodges describe themselves as a contemporary collection of waterside lodges in the heart of North Yorkshire. VIP lodges include their own hot tubs and are well appointed around the site's 13 fishing lakes. Thirsk and York are just a short drive away and there's a restaurant and bar on site. Looking for a lodge near York? 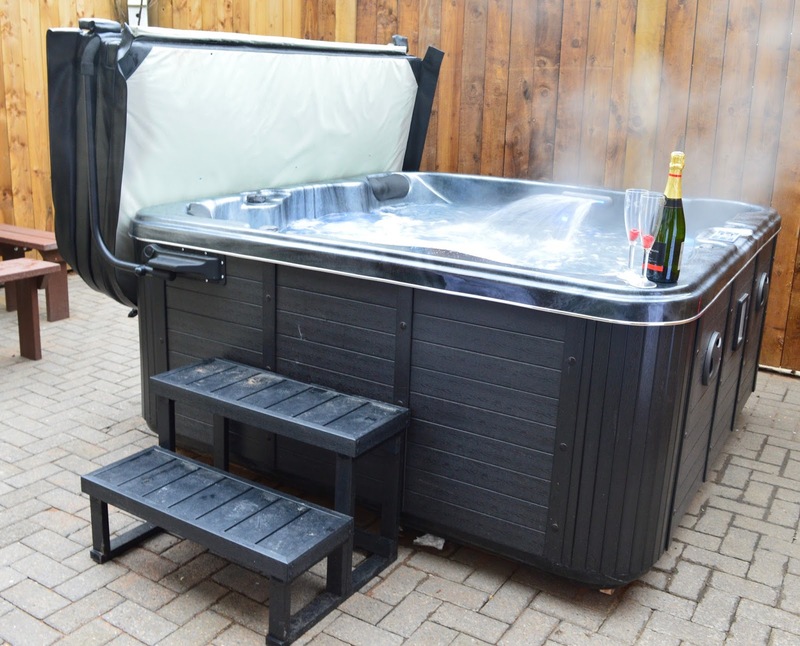 Check out this post: 20+ lodges with a hot tub within a 90 minute drive of York. Tharnet Well Lodges offer first class accommodation near Penrith. Numerous lakes are within easy reach and the lodges offer a peaceful retreat with stunning views of the surrounding countryside and wildlife on your doorstep. Check out their luxury lodges if you'd like a hot tub. How about The Brae? A delightful Shepherd's Hut in the Yorkshire Moors with an enclosed garden and hot tub. Find out more here. You'll find Lambley Farm Cottages near Haltwhistle. There are 5 to choose from, each with their own character and charm and Kingfisher Cottage comes with it's own 5 person hot tub. Expect lots of traditional features and high quality furnishings. Mount Hooley Lodge is a secluded lodge situated in an area of outstanding beauty in the heart of the penines. Accommodation can all be found on one level and the stunning views make it feel as if you are sitting on top of the world. Alston is England's highest market town and is a lovely place to explore with it's cobbled streets and craft shops. How about Yorkshire Lodge near Richmond? A bright and spacious log cabin with hot tub and a play park close by? Find out more here. Barforth Hall Dairy is available to book through Sykes Cottages. There's a beautiful garden complete with it's own hot tub, a wood burning stove and a number of trails lead right from the cottage doorstep. There's a family of alpacas living on-site and stabling can be arranged. The cottage is well located for visiting High Force, Hamsterley Forest & The Bowes Museum. Escape Hot Tub House is located next to the owner's beauty spa so the perfect spot for a girl's weekend break. There are 4 double bedrooms and you'll find an open fire and hot tub on the patio. There's lots of comfy outdoor seating too. How about The Lookout? A wonderful log cabin overlooking a waterfall with hot tub and jacuzzi (may be a little over 2 hours drive). Find out more here. There are two Forest Holiday locations in Yorkshire - Keldy on the edge of the North Yorkshire Moors and Cropton just minutes away from North Yorkshire Steam Railway. Both parks offer a beautiful woodland setting with a range of facilities where you can really relax and get away from it all. Cabins sleep up to 10 and range from snug hideaways for 2 to sprawling treehouses with their own hot tub. Flowery Dell Lodges are just one mile away from Richmond and perfect for a romantic and peaceful getaway. Some lodges feature hot tubs and saunas and special extra treats such as fresh flowers and in-lodge beauty treatments can be arranged. 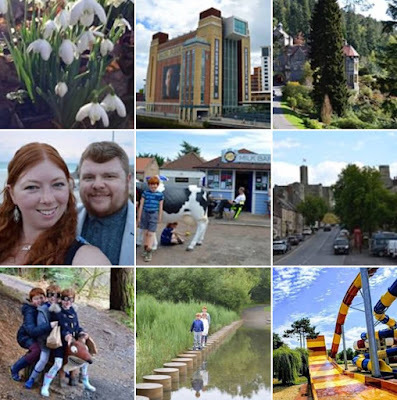 Center Parcs Whinfell is one of my favourite places to stay and home to one of my favourite spas. Some of their lodges come with private hot tubs and saunas and you'll be spoilt for choice with on-site activities to enjoy. How about Kim's Kabin? A cute open plan cabin with a hot tub in Burniston. Pet-friendly too. Find out more here. Situated around two large lakes, Pickering Lodges are just the right place to relax and enjoy a spot of shopping in the market town. There's a children's play area and glass fronted bar and grill on site (they also deliver). Roulotte Retreat is home to 6 gorgeous Roulotte Gypsy Caravans. They look so sweet! If you book 'Zenaya' you'll be treated to a special eco hot tub. Perfect for a romantic getaway. How about Badger's Retreat? A modern lodge in the suburbs of Richmond. Find out more here. The Tranquil Otter offers a rural retreat where guests can relax on their lodge decking in a hot tub overlooking a private lake. Enjoy local walks and wildlife or country pubs and each lodge has it's own boat which is moored next to your lodge and free for you to use and enjoy the lake. Looking for more days out ideas? Why not follow North East Family Fun on Instagram here. I post a new idea every morning at 7am each day and my stories share real-time and an un-edited look at some of the things we get up to. Phew! That's some list. Let me know if you've stayed in any of these places and if you'd recommend or if there's anywhere else I should add to my list. If I'm honest, I had no idea that there were this many lodges around the North East! 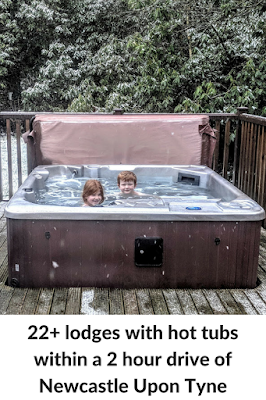 I'm constantly looking at little weekend breaks and hot tubs are high up on my list of things that attract me to a lodge, so I'll keep coming back to list to see which one I fancy! Great post. We've been looking for a lodge with a hot tub for our anniversary break so may well consider some of these. I often find myself googling the title of this blog post, brilliant round up and one I will bookamrking! Love the sound of the tranquil otter!! Fab post and worth the wait! :-) Saved to my favourites for when we are looking to book somewhere for next year. Thank you! We've stayed in Rocklands Lodges in Pickering & really enjoyed it (2 adults, 2 kids aged 4 & 2). Its right next to Flamingo Land too. I would definitely recommend it. Really want to try some of these other places now too! Thanks for the list! OMG this post is BRILLIANT!!! This is going to be such a useful reference guide going forward! We're celebrating our wedding anniversary at the South Causey and have a hot tub room booked, can't wait! Really want to go to Crab Manor, still not forgiven Simon for falling over a pavement the morning we were supposed to attend a wedding there ... what an idiot! Silly Simon! The Crab Manor is lush (as is South Causey). How much fun would it be to work your way through the entire list?? Oh I love this list so much. I've never ever stayed in a hot tubbed lodge and I reeeeally want to. I've now bookmarked this and am going to book something! I never knew we had so many lodges near us. They all look fab, going to have to investigate some of these.